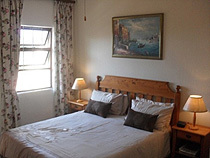 Self catering unit, Queen Bed en suite Bath/Shower, Lounge, Kitchenette, B/fast ‘nook’, Coffee/Tea Tray, Private entrance, Sea facing Patio, bbg, Ceiling fans, TV M-net, DVD player, WiFi, Fully serviced, Linen & Towels supplied. Self catering unit. 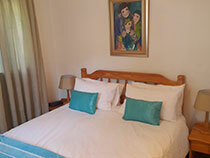 Queen Bed en suite Shower, Double Vanity, Private entrance, Sea facing patio, bbq, Kitchenette, B/fast 'nook', Coffee/Tea Tray, Ceiling fan, TV M-net, DVD Player, WiFi, Fully serviced, Linen & Towels supplied. 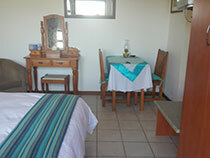 Self catering unit, 2 Bedrooms; one x Double room, one x 2 Single Beds, sharing Shower over Bath, Private entrance, open plan Kitchenette/lounge/Dinning area, Sea facing covered deck, bbq, Ceiling fans, TV M-net, DVD Player, Fully serviced, Linen & Towels supplied. Self catering unit. 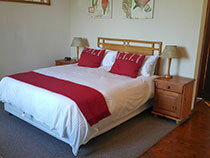 Queen Bed en suite 'Double' Shower, Private entrance, Open plan lounge, Kitchenette/B-fast 'nook'. 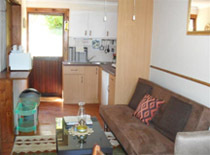 Coffee/Tea Tray, Sea facing covered deck, bbq, Ceiling fan, TV M-net, DVD player, Fully serviced, Linen & Towels supplied. Self catering unit, King/Twin bed en suite Bath/Shower,Open plan Kitchenette/Lounge/Dinning area, Ceiling fans, Private entrance, Sundeck & Patio - pool & Sea facing, bbq, TV M-net, DVD player, WiFi, Fully serviced, Linen & Towels supplied. 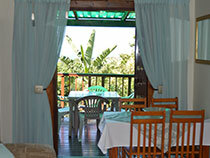 •	Self catering for 2 persons sharing. •	Bed & Breakfast per person. We do not allow pets - we have our own cats. We accept all major Credit & Debit cards, Bank EFT's & Travel Vouchers. 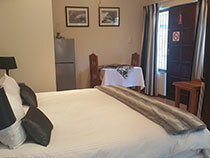 Check in from 14h00 - 21h00 - We do not provide 24 hour reception service. Children can only be accommodated in the Family Unit (Log Cabin 4). We do not allow Students, Group Bookings or Party Crowds. 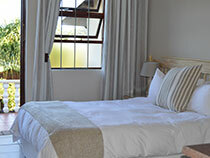 A R100 surcharge will be added for one night stays on the weekends. REFUNDS OF DEPOSITS for short notice cancellations i.e. Cancellations of 0 to 14 days prior forfeit 100% of the deposit. Cancellations of 15 to 28 days prior forfeit 50% of the deposit.